The daily article from October 6, 2017 presents a summary of 2016 ARC-CO payments for corn, soybeans, and wheat. Today’s article provides county level estimates of PLC payments for these crops using average program yield data provided by the Farm Service Agency (FSA). We also compare payment levels across the ARC-CO and PLC programs for the 2016 year. The Price Loss Coverage (PLC) program triggers payments when a program crop’s average price over the marketing year (MYA price) falls below its fixed reference price. The PLC payment rate per unit is equal to this price difference, and is capped at the difference between a crop’s reference price and the loan rate used for the marketing loan program. Table 1 below provides the reference prices, loan rates, maximum payment rates, actual 2016 MYA price, and final PLC payment rate for selected program crops. Information for all program crops for the 2016 program year is available from FSA. With the exception of soybeans and barley, the MYA price for all program crops included in Table 1 is below the reference price, triggering a PLC payment in 2016. 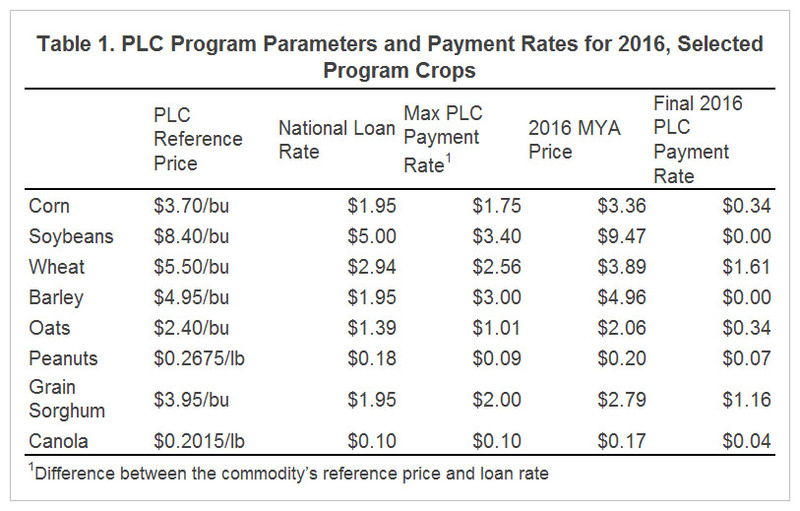 The 2016 PLC payment rate for corn is $0.34/bu ($3.70 reference price minus $3.36 MYA price) while the payment rate for wheat was $1.61/bu ($5.50 reference price minus $3.89 MYA price). The PLC payment equals the commodity’s payment rate multiplied by the farm’s PLC program yield for that commodity. Payments are received on 85% of base acres. As with ARC-CO payments, PLC payments in 2016 will also be impacted by the Federal budget sequester which reduces the payment level by 6.8%. In the county-level PLC payment estimates presented in the following section, the 85% payment rate and sequester reduction have been incorporated so that payment levels should be interpreted as the net payment received per base acre. Figures 1 and 2 provide maps of average PLC payments by county for corn and wheat, respectively, in 2016. These county level estimates are based on the final payment rates for corn and wheat reported in table 1, and average program yields by county provided by FSA. Payment levels for an individual farm will differ based on its specific program yield for each commodity. All farms with corn base which elected the PLC program will receive a payment for 2016, with the size of that payment determined by the farm’s program yield for corn and the farm’s base acres. PLC payments per corn base acre in 2016 are largest in the Midwest region, particularly in southern Minnesota, the northern portions of Iowa, Illinois, and Indiana, and northwestern Ohio. Relatively large PLC payments (more than $30 per acre) are also triggered in various Nebraska and Kansas counties. This regional pattern in relative payment size per base acre is driven by relative program yields. As with corn, all farms with wheat base which elected PLC program coverage will receive a payment for 2016. Areas with larger PLC program yields for wheat will receive larger payments, in many areas exceeding $50 per base acre. This includes a portion of the Midwest region extending from Missouri to Ohio, and from Wisconsin and Michigan through Kentucky, Tennessee, and parts of eastern Arkansas. Large payments on wheat base will also be received in counties scattered throughout the western portion of the US. Figures 3 and 4 provide maps illustrating the difference between average ARC-CO and average PLC payments per base acre by county for corn and wheat, respectively. The difference reported is equal to each county’s ARC-CO payment per base acre less that county’s average PLC payment per base acre. Thus, negative values (shown in yellow or red) represent counties where the average PLC payment per base acre exceeds the ARC-CO payment per base acre while positive values (in yellow or green) represent areas where the ARC-CO payment per base acre is larger than the average PLC payment per base acre. 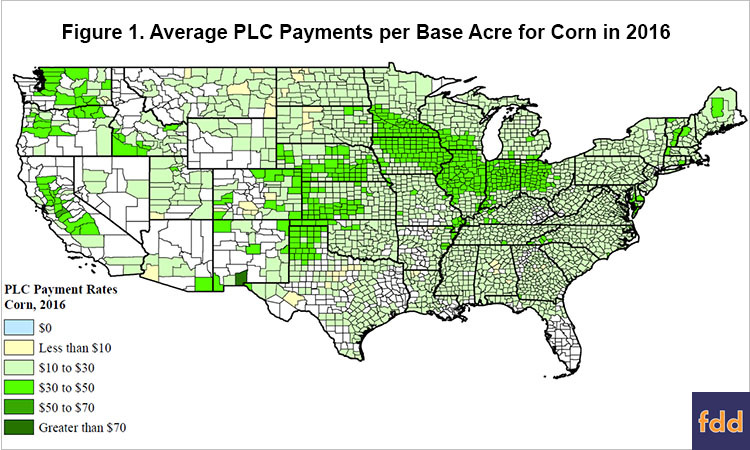 Illustrated in figure 3, ARC-CO payments per base acre for corn exceed those from PLC in most of the counties in the western, Great Plains, and southeastern regions of the US. Overall, more than 60% of counties where the ARC and PLC programs are available for corn base will receive an ARC-CO payment that is $10 per base acre larger than the average PLC payment. The ARC-CO payment per base acre is more than $20 larger than the average PLC payment per base acre in more than 50% of counties. In contrast, the majority of counties in the Midwest would receive larger payments from PLC in 2016. Despite low prices, high yields in this region had an offsetting effect on ARC-CO payments in the Midwest. Average PLC payments exceed ARC-CO payments for corn by more than $10 per base acre in 27% of counties, and by more than $20 per base acre in 17% of counties. 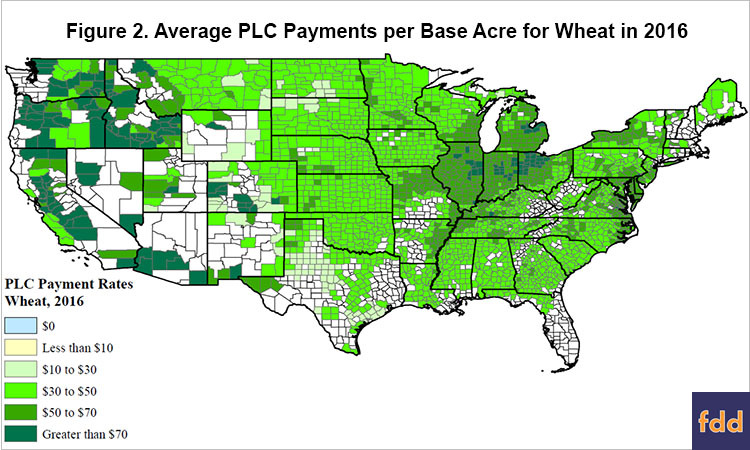 As shown in figure 4, the vast majority of counties trigger larger PLC payments per base acre for wheat base in 2016. 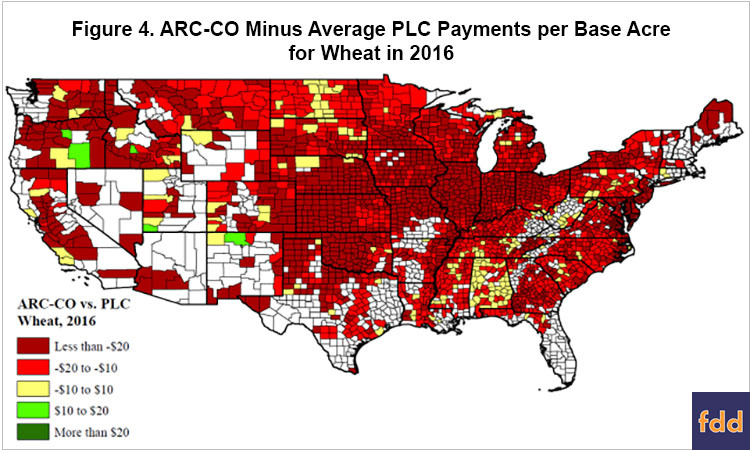 The average PLC payment is more than $10 larger than the ARC-CO payment in nearly 92% of counties with ARC and PLC programs for wheat base. The average PLC payment is more than $20 per base acre larger than the ARC-CO payment in more than 57% of the counties. This large payment difference of more than $20 per base acre captures the main wheat producing areas of the country. Again, while low wheat prices had the effect of triggering PLC and ARC-CO payments, most wheat producing areas experienced high yield levels, offsetting the price effect for ARC-CO payments. Less than 1% of counties triggered an ARC-CO payment per wheat base acre larger than the average PLC payment. Low commodity price levels led to PLC payments being triggered for a number of program crops in 2016, including corn and wheat. The size of PLC payments per base acre vary regionally by the size of PLC program yields for those crops, with larger payments being triggered in areas with larger program yields. This includes the Midwest region for corn, and the Midwest, Great Plains, and Western regions for wheat. 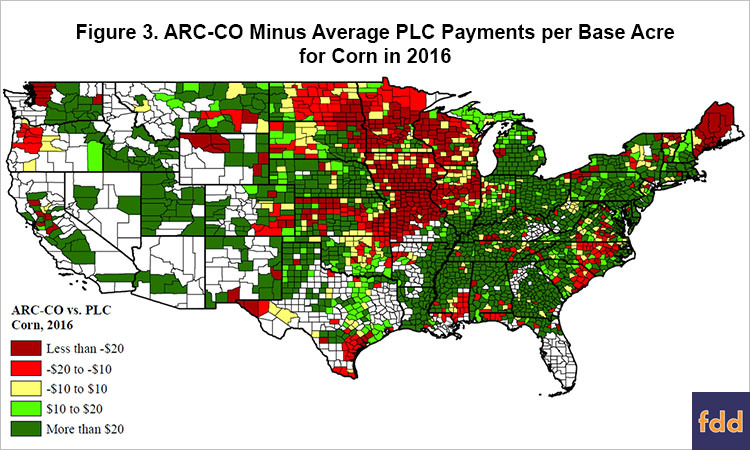 In general, ARC-CO payments on corn base are larger than PLC payments for the majority of counties. However, high corn yields in areas such as the Midwest led to smaller, or zero, ARC-CO payments levels per base acre for 2016. For wheat, farms in the vast majority of counties will receive larger payments per base acre if covered by PLC, with the difference exceeding $20 per base acre throughout most of the Great Plains and Midwest regions. Paulson, N., G. Schnitkey, J. Coppess, and C. Zulauf. "2016 ARC-CO Payments." farmdoc daily (7):183, Department of Agricultural and Consumer Economics, University of Illinois at Urbana-Champaign, October 6, 2017.